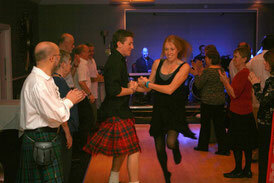 To end the games each year we have a traditional Scottish Ceilidh Dance held in a local venue. 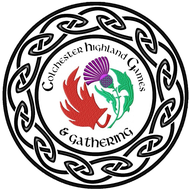 Ceilidh dancing is taught in Scotland as part of the school curriculum, but did you know there are also local classes in Colchester County? Classes will start again in April - Dates to be confirmed. 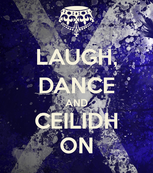 Ceilidh Dancing = Dancing Reels & Jigs = Controlled Abandon! Come and abandon yourself to dance. Feel free, get fit, loose weight, have fun and laugh. There are no strict rules in our classes. Our dances will be shown in low and high impact where applicable. Once you have learned the basic steps you are free to perform them to your own level. High impact tends to be a more formal style of the dance with appropriate footwork, ‘toe pointing’ and ‘jigs’. If you attend classes regularly you should start to feel an improvement in your fitness level. There is no requirement that you should obtain expert levels of dance skill. These classes are mainly to have fun, improve your body tone and fitness and hopefully meet some new friends into the bargain. Every class is different and various dances will be learned throughout the course. *Before participating in any fitness programme it is advisable to discuss the implications to your health that this may bring with your doctor. We encourage you to participate at a level that is comfortable for you. 1600’s – still going strong. Each week will have initial similar components before practicing and learning the actual dance in an aerobic style workout. Learning the Dance…….....New dances are learned on a weekly basis. Dance Reminders................We will go over previous dances each week as time permits and as per requests. The class is structured to enable you to ‘catch up’ and learn the dances as they come around. Each dance will be practiced again throughout the season until everyone is comfortable with the steps. If you make mistakes don’t worry, it is meant to be fun, and mistakes are sometimes what makes it fun. Just stop and wait until the next section of the dance then join back in. Some dances are extremely easy and some are more tricky to master. I don’t expect everyone to have the same skills and I am happy to go over steps until everyone present is happy. I have been doing this since I was 4 years old and even I get it wrong sometimes. Feel free to stop and chat at the end of the class. I am always interested in what you would like to learn. can be low or high impact depending on how much energy you wish to put into it. Some dances are more tricky to learn than others but our main aim is to have fun and learn a new skill. Anyone young or old can participate. Come prepared to have fun. You can bring a partner or borrow one of ours! 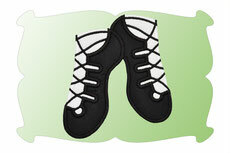 Comfortable clothing and indoor sneakers or dance shoes. Wear layers that you can take off as you get warmer. If you want to wear a kilt - please do. On the left is one version of the 'Strip the Willow' dance. You will note the fast speed and sometimes the ladies being hoisted up in the air. This is filmed in Scotland where most of the dancers have been dancing since they were small. I have tried to include those closest to what is taught at classes. Enjoy!